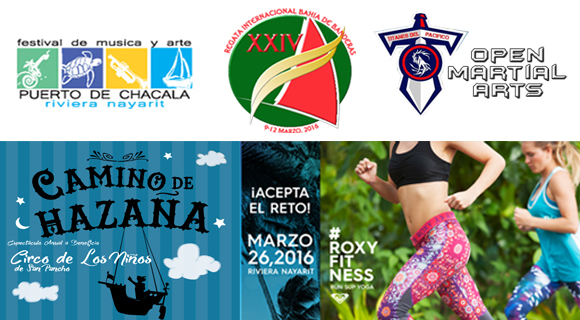 There’s the XXIV International Banderas Bay Regatta, the 3rd Puerto de Chacala Music Festival, the Children’s Circus, the Riviera Nayarit Hot Air Balloon Fair, the “Titans of the Pacific” Martial Arts Open, the #RoxyFitness Riviera Nayarit and, on top of it all, it’s Easter Week! March is going to be a month of high-octane fun in the Riviera Nayarit as it play host to all kinds of artistic and sporting events, including martial arts, sailing, Stand Up Paddle, races, yoga, the circus arts, music, hot air balloon flights and, as if that weren’t enough, it’s time once again for the traditional Easter Week vacation. The Nuevo Vallarta Yacht Club will receive sailboats from North America to compete in the best destination for sailing in the Mexican Pacific and enjoy parties, savor excellent cuisine and much more. This is a huge musical celebration, with four days of dancing and singing in the streets of Chacala. The community offers yummy beachfront cuisine and will host big international and domestic artists. The kids and teens of San Pancho put on a yearly show with what they learned from Gilles Ste-Croix, co-founder of the Cirque Du Soleil, and the group of professionals that have encouraged this unique artistic project in Mexico. Nuevo Vallarta hosts this beautiful festival for the very first time, where you can take to the skies in a hot air balloon or simply enjoy the view of the colorful balloons against the gorgeous scenery. The Paradise Village Convention Center in Nuevo Vallarta will host the Qualifying Martial Arts Championship presented by the Nayarit World Association of Kickboxing Organization (WAKO). Over 400 competitors of all ages will participate.